The ascetic garlic of the spring onion department (It is said the [Gyouja-ninniku] and the Ainu spring onion) is very effective in the nutritional fortification as well as a usual, liliaceous garlic. The cultivation method is also different. slower than usual garlic growth grow of the ascetic garlicIt is necessary to grow a lot of stocks to make it to for food though there is little thing to which it gets sick, and the insect adheres. Fermentation starts when organisms such as the grass, the fallen leaf, rice skin, and rice bran that weed are piled up, and water is poured. This is counterattacked many times. When compost can be done, it cultivates it several times with the soil with the tractor and the cropper mixing it. There seem should be a lot of compost. The soil of the ascetic garlic cultivation doesn't care about an acid feeling a little because acidulous is good either. 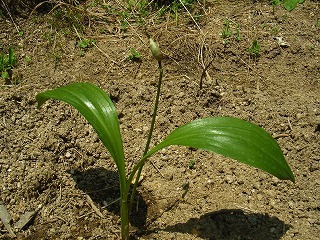 The seedling of the ascetic garlic is bought in the do-it-yourself store and the gardening shop. It might be difficult to look for the one quite marketed. In that case, it looks for on the net. I found it in the do-it-yourself store. The planting depth is adjusted to about 10-15cm. 3-5cm soil covers the upper part of the bulb. The planting place often applies the shadow to sunlight to enlarge it early at half a day though it grows up. A little humid places might be better than too dry places. You will interrupt the direct sunshine at the midsummer a little. It is originally strong in the cold because it is the one that grows naturally in Hokkaido, and need not do anything in winter. Moreover, it withers in winter and there is nothing in the above-ground part, too. The seedling is planted as a lot as possible and put up because it doesn't grow easily. As for the harvest, if it doesn't plant of how many, when comes is not understood. It is possible to increase it when growing to some degree by the method of dividing the sprout that went out sideward of the old share in the stock. 2-3 sprouts come out from the seedling grown for four years or more. After it grows up to some degree greatly without forcibly dividing the stock into the too small one even if the sprout goes out, let's divide the stock. A small, white flower bloomed in the ascetic garlic in around the middle of May. The flower blooms when doing for 7-8 years after it usually seeds it. It seems to look like the flower of the leek somehow. It is possible to increase it from the seed by gathering the seed after the flower. 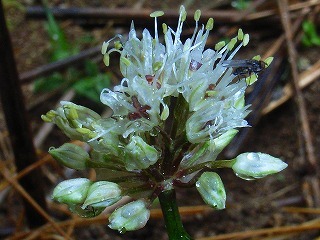 The leopard falls and the leaf of the ascetic garlic has been done when later of the flower in 2009. Because the rate of germination is low to raise the ascetic garlic from the seed, it puts in Hotei after it keeps with the refrigerator with the seed that had been gathered in around July applied to about 1-2 week water or it applies it to the day water and it keeps it in the refrigerator. Then, the rate of germination can be raised by awaking from dormancy. Moreover, the rate of germination falls by sow the seed as soon as possible when gathering it important, and the delay of the time of sowing. When the soil on the surface dries, stock origin is watered. When autumn comes, ripe compost and the ferment oil dregs, etc. are done to stock origin because the leaf becomes yellow in July and it withers. The stalk and the leaf are harvested in beginning of April - the middle of May. The stalk is left from the root without fail by 2-3cm or more. It will take about 2-3 years by the harvest next time when harvesting once because it grows slowly. As for the ascetic garlic, it is known that the natural healing power in the inside of the body is improved when eating like usual garlic, and the element that prevents cancer is included. There is an excellent effect in the allicin of the element of the smell of garlic. On the other hand, it is easy to go out to outside of the body because this vitamin is a water solubility though it is vitamin B1 that it is necessary for burning the glucidic in the inside of the body. The dish of the ascetic garlic is easy. The ascetic garlic is wet-cleaned. And, the leaf of the ascetic garlic is made "Boiled green". It dresses it with contracting and the soy sauce and the miso. In the ascetic garlic, obtaining is a difficult vegetable. Or, it can be delicious even if it cooks after it quickly boils it. You may stir-fry, and season with chicken and pork by the miso, sugar, the mirin, and the print sesame seeds, etc.